This is your basic "tragedy of the commons" in action. 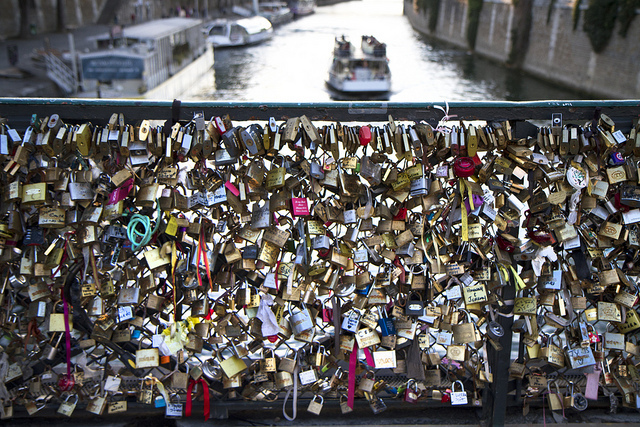 It's fine if one couple locks a padlock discreetly to a bridge. It's not very visually attractive, but most people will probably never notice it. But when tens of thousands of visitors lock padlocks to a bridge, it's not only ugly, but the combined weight of the padlocks eventually threatens the bridge itself. Such is the case for the Pont des Arts Bridge in Paris, which is the epicenter of the love lock phenomenon. Last summer the weight of the padlocks broke a railing. This week, the city council announced that they would remove all of the be-locked railings, and replace them with a padlock-attachment-proof railing with panes of glass. Meanwhile, love locks are turning up everywhere. Please stop!